Of the 19 Joint Reports, only No. 3, 6,14,15,16,17 and the Memorandum are of concern here in varying degrees. After these Officials arrived in Adelaide, they had cable related discussions with State and Federal Officials. State Officials were effectively powerless, due to the telegraph system having been taken over by Federal Officials. Cable traffic routes were also a matter of great concern. Nearly all South Australian telegrams are marked "Via Eastern" by the senders, and even those not so marked are usually sent by that route, due to the continued use of the old Darwin message forms. Federal Authorities issued an order for new message forms with "Pacific" substituted for the "Darwin" indication. While State Officials were friendly to the EEA&CTC, Federal Officials were hostile, and favoured the All Red Route across the Pacific, as a means of getting messages to North America and Europe. It was pointed out by Federal Officials that the Company had brought this problem on themselves, as a result of refusing to reduce tariffs when the Inter-Colonial Conferences were prepared to accept a reduction in lieu of the Pacific Cable. The decision on whether or not to relocate the Company's Adelaide offices to a more suitable location was left over for later consideration until the outcome of the upcoming Pacific Cable Conference was known. A direct quote of the Company Officials' Report is in order to clarify the situation. The C.S. Restorer when in harbour is stationed alongside our Wharf and Cable Depot at Port Adelaide; and the position would be a very suitable one if the Railway and passenger bridge were above, instead of below it. As it is, the Ship, when required to go to sea, has to pass through a narrow opening leaving a space of only a few inches on either side of her. This necessitates the greatest care in handling the Ship, and sometimes delay in getting through. Apparently there is no practical remedy for this state of things, but we have discussed the matter in a friendly way with the Government Engineer in Chief, who has promised to do everything he can to facilitate the Ship's movement and safety. We found the Cable Depot, Tank, Caretaker's House, &c. well arranged and everything in good order and condition. The Ship, however, was not in the smart efficient state we expected to find her. The machinery in the Engine Room and on deck was in first rate condition; but the Hull wanted painting in places, and was more or less dirty and shabby looking. The deck had also opened out and leaked in places badly, and urgently required caulking. It appeared that the Captain had already represented to the Head Office that the authorised Harbour Crew were insufficient for the Ship's requirements, and he repeated the arguments given in his letter to London that it was impossible to keep the Ship in proper condition without more deck hands. There is no doubt that the local conditions are very different here to those prevailing in Singapore and London, and, in our opinion, the number of deck hands ought to be increased. We are now in cable communication with Sir John Denison-Pender on the subject. The caulking of the decks is absolutely necessary, and we have, therefore, arranged for this work to be carried out as economically as possible, together with one or two other small matters needing attention. We leave Adelaide to-day for Melbourne, where we purpose spending about a week seeing the Prime Minister, other members of the Federal Ministry and representative Melbourne people. Considerably more time than this will have to be given to such an important political centre, and it was our intention to spend about 8 weeks continuously in Melbourne, and then go to the other Capitals, and afterwards proceed North. But, as the political situation is at present rather peculiar, the Labour Party having increased their members in the new Parliament, and, consequently, being in a position to dominate the other members, unless, as some people think will happen, the Government and Opposition coalesce, we think it advisable that we should be on the spot when Parliament opens early in March, to see what happens, and act accordingly. It is just possible that the Labour Party will take office, in which case we shall have to deal with Mr. Kingston, their recognized leader, instead of Mr. Deakin. Our present idea, therefore, is to spend a few days in Melbourne, then visit our Flinders and Georgetown Stations, proceed to Hobart, New Zealand, Sydney, and return to Melbourne shortly before the opening of the Federal Parliament. By that time the Pacific Cable Conference may have met and come to some decision, which would clear the ground here considerably. This Report is sufficiently important that it is directly quoted in its entirety. Question transfer Restorer was carefully considered before we left London, and since becoming personally acquainted with local conditions we have further considered it. Only way of reducing expenses is to transfer ship from this region, all Australian Ports being equally costly; but so long as we have to maintain Zealand Cables we think it would be neither safe nor economical to transfer ship. Our report No. 3 refers to Restorer's existing station, and by next mail we will write fully on general question. Unfortunately the conditions prevailing at all Australian Ports in regard to employment of white labour, and the payment of union wages, etc., make it impossible to run a ship in this region as economically as at Singapore, and other ports where more reasonable conditions are in force. In addition to this serious disadvantage, there is the inconvenient situation at Port Adelaide referred to in our Report No. 3. Consequently, if the situation were a monetary one only, we should have no hesitation in recommending the Restorer's removal; although in that case the large expenditure incurred in constructing the wharf, erecting cable tanks, stores, &c. at Port Adelaide, would be thrown away, and the valuable site of land obtained from the Government would have to be given up. But other important factors are involved in this question, and it might perhaps be convenient to recall the circumstances which influenced the Board's decision in favour of Port Adelaide as the ship's Station. In the first place it was considered necessary to have a repairing steamer in Australian waters to speedily repair the Adelaide-Perth and Cocos Cables in case of accident. Secondly, the frequent trouble experienced with the New Zealand Cables, and the great expense and inconvenience attending the dispatch of a ship from so distant a Port as Singapore made it advisable to station the Restorer as centrally as possible between the New Zealand and Cocos-Perth waters. Thirdly, there was the necessity for the ship to be within easy reach of docking facilities; the only docks existing at present, in this region being at Melbourne and Sydney, although docks are in contemplation at Adelaide and Fremantle in the near future. Then there was the political factor, both the South Australian and the West Australian Governments being most anxious for the ship to be stationed within their respective territorial waters, and offering the Company land and other inducements to achieve their objects. As the Board are aware, the Restorer has already had to effect repairs off Fremantle and in New Zealand and Tasmanian waters, as well as dock at Melbourne and Sydney, and the convenience of such a centrally situated Station as Port Adelaide has, therefore, been clearly demonstrated. The New Zealand Cables are not likely, in our opinion, to give less trouble in the future than in the past, but possibly more; and so long as we are obliged to maintain them we think it would be a mistake to remove the ship to a more distant port. It might be urged that as the New Zealand Cables are being worked at a loss their repair in case of interruption would not be of urgent importance, and the operation might therefore be left to suit our own convenience; but, on the other hand, there are important political considerations involved in the efficient maintenance of these cables at the present time, when we are fighting an uphill battle for the New Zealand and other traffic; and a prolonged interruption between Australia and New Zealand would certainly injure the Company's interests very seriously. If the Restorer were removed from Port Adelaide she would have to be transferred to Singapore, as there is no suitable port outside the Australian region that would answer our purpose equally well; but under all the circumstances we would strongly advise keeping the ship at Port Adelaide, at all events for the present. Two pages of this Report are quoted directly. We saw a good deal of the Company's Ships whilst at Singapore, and took the opportunity of entertaining the Governor with his daughter and Suite at luncheon on the Patrol. The ship was in excellent order, and His Excellency was very pleased with all he saw. The Restorer was also in much better order, although she had only recently returned from cable repairing work, than when we previously saw her at Adelaide; and, the Recorder (1) - considering her age (19 years), is in very good condition, and apparently serviceable for many years longer. Many questions of detail were brought to our notice by the Commanders and Officers, and discussed. Amongst others, the long period of work exacted before leave is granted, and the overlapping of Officers' scales of pay - which causes anomalies and dissatisfaction. These matters ought, in our opinion, to be reconsidered and revised, and we purpose bringing them before the Board, with our recommendations, later on. As we have today wired, we have arranged for the Restorer to carry out the authorised Hongkong-Foochow renewal work forthwith. The season is now favourable, the ship can be conveniently spared, and the Cable Depot people will be glad to get rid of the cable, some 85 knots - so as to facilitate their reclosing operations. We shall take the opportunity of proceeding to Saigon, Hongkong, &c. in her. When at the Depot we discussed with Messrs. Jones and Weaver the authorised Cable renewal programme, and arranged for it to be brought up to date, with a view to the Board's consideration. We did not think it advisable to disturb the Restorer's vitualling experiment, but impressed upon Captain Morrell the necessity of exercising every possible economy in the purchase and distribution of the supplies. Singapore, with its roadstead and docks full of shipping, is a busy, interesting port, and we were glad to hear people in a position to speak with authority refer hopefully to the future of the Straits Settlements. The present financial position is certainly very satisfactory, but the prosperity of the Straits depends very largely on the tin industry, and recognizing this the Authorities are endeavouring to open up additional sources of revenue by encouraging the cultivation of rubber &c., for which there appears to be a very bright future. The silver question is also becoming settled, and it is believed that before long the old Exchange fluctuations will be a thing of the past. Only the closing paragraph is quoted here. Finding the overland journey so tiring, uncomfortable and slow, we arranged for the Restorer to embark us at Banjowangie, instead of Batavia as at first intended. We are now on our way to Cape St. James, where we hope to arrive on 6/6/1904. Only the last two paragraphs are quoted here. The Restorer is making very slow progress on this run, owing to the foul state of her bottom. Her average speed, with a daily consumption of about 50 tons of Japanese coal, is very little more than 10 knots an hour, instead of 12 to 12½. We have therefore instructed the Captain to dock at Hongkong, before commencing the cable renewal work, and arranged for all our ships to be docked every 3 or 4 months, or even oftener if considered necessary. Ships lying in the Singapore Roadsteads get filthy in an incredibly short time. We shall leave the Restorer at Hongkong, and after finishing our business there, proceed to Foochow, and thence to Shanghai, as soon as possible. This Report is directly quoted in its entirety, as it gives an excellent insight into Cable Stations in China, and the lives of the personnel. We arrived at Hongkong on 10/6/1904, and, after inspecting the Company's Offices, Cable Houses, Cable Store, etc., interviewing Officials and Commercial representatives, and visiting Macao, left Hongkong for Sharp Peak yesterday morning. Our Hongkong Offices are in a fine substantial building, situated on the sea front, close to the Banks and leading Commercial houses. It is well designed and built, but wants painting and generally doing up, both inside and outside, and we arranged for a Specification of the necessary work to be prepared and tenders invited. The Instrument Room is a very fine one, spacious and well lighted, ventilated and arranged, and could conveniently accommodate additional Staff. The Superintendent's Office, Counter, and other rooms are also conveniently arranged and in good order, but the Native Latrines, being inside the building, become very offensive towards the close of the day, and a proposal was placed before us for substituting for them, and the European W.C.'s a modern flush system including our own water supply from a well sunk inside the building. In submitting this proposal it was believed that the Sanitary Board would not allow the Regulations as to emptying the Latrines every 24 hours, to be departed from. When, however, we called on the Acting Governor (Mr. May), we mentioned the matter to him, and asked whether, in consideration of the public nature of our service, necessitating keeping open the Office night and day, the Sanitary Board could not be induced to relax the Rule in our favour, and His Excellency promised to see the officials and get them to agree to our request. If this is done it will practically meet the most pressing requirements, and save spending a good deal of money, certainly for the present. Besides accommodating our own Staff, the office building accommodates the Chinese Telegraph administration, and the Great Northern Company. The latter's Instrument Room is rather small, but their Public Counter is as large and well situated as ours is, and the Superintendent's Office and other rooms are apparently sufficient for their comparatively limited wants. In fact the best possible arrangements seem to have been made, when introducing the new system of separate working, to meet all reasonable requirements, and it now only remains for the two Head Offices to agree on a fair rental for the accommodation provided. Before we left London, Messrs. Leigh & Orange, the Architects who designed and superintended the erection of the building, were instructed to furnish a written estimate of the rental value of the Great Northern Company's accommodation, and this has been done, and a copy of the estimate sent to the Head Office for the Board's information. The Great Northern Company may possibly want the assessment value taken as the basis of apportionment, but as all property in Hongkong has greatly risen in value since the last assessment was made, that basis would be misleading and unfair to us. We found the Staff, generally speaking, in good health, but the locals (half Portuguese) are of poor physique and very often ill; moreover, of late years increasing difficulty has been experienced in getting, and retaining when trained, suitable Portuguese operators and clerks, as the work and hours in the Banks and commercial houses are considered less onerous than in the Telegraph Service. Consequently it is a question whether it would not be better to increase the number of Chinese operators, so as to make the Company more independent of the Portuguese. We will therefore discuss this matter with the Board on our return. Both the European and local staff complained of the inconvenience and additional expense caused to them by the hours of duty being split up instead of continuous, as was formerly the practice at Hongkong, and as is the case at other Stations. The locals also complained of their annual leave having been entirely stopped several years ago, when the Philippine war caused such a rush of traffic, and asked that the privilege might be restored without further delay. This and the split duties, are certainly hardships and can only be defended on the ground that the traffic, and demands caused by the opening of new Stations, have increased beyond our capacity for furnishing suitably trained staff to meet the requirements. Now, however, that our training facilities are so greatly increased and improved, additional operators ought, before very long, to be available for fully manning the Hongkong and other Stations, where we have been obliged to work short-handedly, and thus enable us to remedy the grievances complained of. Our attention was also called, both by the European and local staffs, to the considerable rise, of late, in the cost of living, and to the difficulty of keeping within their incomes. Even the Chinese employes handed us a memorial on the subject, and as Hongkong is undoubtedly one of the most expensive Stations we have visited, we are obtaining full data from independent sources to submit to the Board on our return. Staff's relations with G. N. Co.
We were glad to find the relations between the respective Staffs of the Eastern Extension and the Great Northern Companies, cordial and satisfactory. Our interviews with the representatives of the leading business firms, were very satisfactory. They all expressed themselves contented with the service, as regards speed and accuracy, but some of them thought the Tariffs were still too high, and are looking forward to the German-Dutch Company bringing about a further reduction. Happily the amended Deposit System has given satisfaction, and put an end to the unfortunate agitation that was evoked, by the introduction of the new arrangement. Jardine, Matheson & Co. will now, we believe, formally adopt it, but Gibb, Livingstone & Co. say they find it equally convenient to pay for their telegrams as they are dispatched, and will continue that practice. During our interview with Mr. May, who was very friendly and subsequently entertained us at Dinner, the long pending question of our acquiring the Chinese land lines, in Kowloon British territory, was raised. His Excellency had not heard of the action of the Chinese Government in taking over the Chinese Telegraphs a year or two ago, and said he would again communicate with the British Minister at Pekin, with a view to the Chinese Telegraph Officials being instructed to arrange the necessary details with the Company. We shall probably learn at Shanghai whether any developments have recently taken place, and when in Pekin be in a position to discuss the question with Sir Ernest Satow, and the Chinese, if considered advisable. An immense number of fine solid buildings are being erected in Hongkong, both along the sea-front and up the slopes, and at the top of the Peak; and with the Harbour always filled with Shipping, and Kowloon rapidly developing, there is undoubtedly a grand future for this important and interesting outpost of the British Empire. Our visit to Macao was very interesting and instructive. We found quite an old world place, much larger than we anticipated, possessing distinct Portuguese characteristics, and containing many fine buildings, well kept roads, and public gardens. The Company's Station is in one half of a very good building, centrally situated near the Government and business offices. The ground floor is used for the counter, instrument room, Superintendent's Office, store rooms, etc., and the upper floor for the Superintendent's quarters, which are well furnished and in excellent condition. For some little time past, however, it has been recognized that the small amount of business with Macao hardly justifies the expense of a European representative at the Station, and we have recently left the Portuguese Clerk (Mr. Rocha) in charge of the Company's interests in Macao, subject to a monthly visit from the Hongkong Office, for checking accounts, cash, etc. and seeing that everything is working satisfactorily. This appears to answer well, and as Mr. Rocha is on good terms with the Government Officials, no difficulty is anticipated in their recognizing him as the Company's accredited representative, under the Concession. If this arrangement is approved by the Board, the Superintendent's Quarters and house servants can be dispensed with, and smaller offices obtained when the existing lease expires next Spring. It is just possible the Government might be able and willing to provide us with the necessary accommodation free of expense, or at a nominal rental, and we have arranged for Mr. Beck (Superintendent at Hongkong), when he next goes to Macao, to see the Colonial Secretary, and quietly sound him on the subject. An inexpensive Portuguese operator would, of course, be required at the Macao Station, to assist Mr. Rocha, and, with this assistance it is proposed to somewhat extend the office hours to enable passengers by the early morning and evening boats, to have their telegrams dispatched before the Boat's departure, or upon arrival at Macao. We are due in Sharp Peak to-morrow, and after spending a few days inspecting that and the Foochow Station, we shall proceed to Shanghai, about the 21st, when the Pacific is expected to pass Sharp Peak, and take us to Woosung. Only the last several paragraphs are of interest and are directly quoted. In our report on the Singapore Station, we referred to the Wharf at the Cable Depot requiring repairs, and the Chief Electrician's suggestion for building a coral wall inside the reef to prevent the reclaimed land slipping away, and silting up the waterway in front of the Wharf. It is estimated that the wall would cost about £1,000. The removal of the C.S. Restorer to Singapore, and its sale to the CPCC, raises the question whether it is necessary, or advisable, to retain the Cable Depot at Adelaide. According to the terms of the Agreement with the South Australian Government, the land (about 3 ½ acres), upon which the Depot is established, would have to revert to the Government, together with the Wharf which cost the Company nearly £6,000, if for one year the land is not used by the Company for purposes connected with its business or operations. In addition to this expenditure, the Company spent nearly £8,000 in erecting the Cable tanks, Cable shed, Store room, Caretaker's cottage, &c., and much of this money would be thrown away if the Depot were abolished. At the present time nearly 250 knots of cable are stored in the Adelaide tanks, and even if the Singapore tanks could accommodate it, which would be impossible under existing conditions, we considerate important that the Company should continue to have a good store of cable in Australian waters to meet possible contingencies. The expenses of the Depot have been considerably reduced, and it is proposed to limit them to merely keeping the Cable tanks, Wharf, &c. in good order. When at Singapore, the question was raised whether the Company has the power to enforce the observance of Agreements entered into by the Local employes, one of the Local Staff (F. L. Smith) having deliberately broken his Agreement, and defied the Company to take proceedings against him. As the Board are aware, we consulted the Company's local lawyers, who advised that the Company has the power to enforce these Agreements. The opinion was communicated to the Local Staff, and we trust it has made a good impression; but the question is a difficult one because, as a rule, the offender is either without means, or places himself beyond the jurisdiction of the courts. Moreover it is questionable policy to try to keep a dissatisfied employe in the Service. Probably the best solution, if practicable, would be to require from the guardians of the local probationers a cash deposit - to be forfeited if the Agreement is not strictly observed, but we fear that in few instances would the guardians have the means to deposit a sufficiently large sum to ensure the strict carrying out of the Agreement. Another matter rising out of our Reports is the overlapping of the Ships' Scales of Pay, which produces anomalies and dissatisfaction, but, having regard to the many points already raised in this Memorandum, we think it better to embody this overlapping, and other Staff questions resulting from the sale of the Restorer &c. in another Memorandum, which we will submit to the Board very shortly. In order to speed up planning for the route of the cable at Midway, the CPCC applied for, and got, access to the soundings taken at Midway by the U.S.S. Nero. Towards the end of 1901 the CPCC requested three cable manufacturing firms to submit tenders for the above project - separate tenders to be offered for the San Francisco-Honolulu and the Honolulu-Manila Sections. (a) The India Rubber, Gutta Percha & Telegraph Works Co. Ltd.
(b) The Telegraph Construction & Maintenance Co. Ltd.
(c) Siemens Bros. & Co. Ltd. The San Francisco-Honolulu Contract was gained by the India Rubber Company with a tender of £456,720 - more than £100,000 less than those offered by the other firms. The TCMC won the Honolulu/Manila Contract with a tender of £983,428. On 4/12/1902 the C.S. Silvertown arrived at San Francisco. She commenced laying the shore end with the help of the local coasting steamer Newsboy and the lay was completed on 14/12/1902. After splicing on, Silvertown commenced paying out at the rate of about 200 nauts per day arriving at Honolulu on 26/12/1902. Bad weather held up the splicing on of the intermediate and shore ends but the latter were completed on 1/1/1903 when Silvertown returned to Hackfeld's Wharf at Honolulu and the testing through from the cable house at Waikiki proved very satisfactory. In all some 2,276 nauts of cable including intermediate and shore ends were laid on this section. C.S. Anglia arrived at Manila on 22/5/1903, laid the shore end and tested the 356 nauts of cable laid from the Straits. She then sailed back to the Straits, spliced on the deep-sea cable and commenced paying out to Guam on 26/5/1903. The Anglia then arrived at Guam on 2/6/1903 having paid out 1627 nauts from Manila. The C.S. Colonia took over the task of landing the shore end which she accomplished on 4/6/1903 making the total length of cable expended from Manila 1631.6 nauts. On 6/6/1903 the C.S. Colonia spliced on to the Guam shore end and commenced her lay to Midway carrying some 2766 nauts of cable. She arrived off Midway on 18/6/1903 having paid out 2600 nauts and work commenced on laying the shore end. 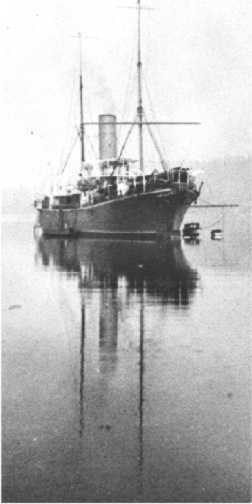 Considerable difficulty was met with owing to the shallow water which made the pull a very heavy task but with the help of Captain Rodman of the U. S. Survey ship Iroquois who lent thirty men the final splice was effected on 22/6/1903 making a total of 2607 nauts paid out from Guam. Between 23/6/1903 and 25/6/1903 the Colonia transferred the remainder of her cable, some 160 nauts, to the Anglia and on 26/6/1903 the latter, with a total of 1620 nauts of cable, spliced on to the Midway shore end and commenced paying out towards Honolulu. On 3/7/1903 the Anglia anchored off Honolulu having expended some 1315 nauts en route and by the next day had laid the shore end and spliced on. The cable was then handed over to Mr. Gaines at Honolulu for the official "round the world" messages. The total length of cable expended , including intermediate and shore ends was 1332 nauts. On 20/4/1903 the first contingent of CPCC employees landed at Midway. The whole cable lay between San Francisco and Manila was completed in seven months at a cost of approximately £1,500,000. In addition to ancillary craft three cable laying ships were employed which between them laid some 7847 nauts of cable. In Sept. 1905 a contract was signed between the India Rubber, Gutta Percha, & Telegraph Works Co. and George G. Ward representing the CPCC to lay a cable from Manila to Shanghai at a contract price of £174,000. C.S. Silvertown completed laying the shore end and commenced paying out towards Shanghai on 24/3/1906. The ship arrived off Saddle Island near Shanghai on 1/4/1906 having paid out 1195 nauts and prepared to lay the intermediate and shore end sections in conjunction with the GNTC's C.S. Store Nordiske. The final splice to the shore end was effected on 11/4/1906, the total length of cable from Manila being 1264 nauts. On 26/7/1904, a Traffic Agreement was signed between the Commercial Cable Co. and the Commercial Pacific Cable Co., in which all the legalities were set out defining how business would be shared between the two systems. 1. To prevent competition, especially by a cable owned and worked, or subsidized, by the United States Government. (No subsidy has been granted by the United States Government). 2. To obtain an alternative route through America for their China and Japan traffic. 3. To ensure the retention of a considerable interest in the American traffic with the Far East, which, it was anticipated, would largely develop in the future. 1. The cable to be worked by a registered American Company. 2. The Eastern Companies to control the American Company, by holding the whole or a large proportion of the shares, and by appointing the majority of the Directors of such Company. except in cases where such routes became interrupted or blocked with traffic; and normally only traffic between America and China, Japan and the Philippine Islands to be transmitted by the Pacific Cable. At that time the EEA&CTC and the GNTC's held exclusive concessions in China and the former Company exclusive rights in the Philippines. An American Company was, therefore, faced with this situation should it wish to lay a cable across the Pacific, and even if it had been able to secure the right to land its cable in China without the co-operation of the EEA&CTC and the GNTC's, it would not have been able to secure traffic from China because China was obliged, under the Concession granted to those Companies, to hand them all the traffic they collected for Europe and America. For many years an agitation had been going on in the United States for the laying of a Pacific Cable, which was considered a national necessity. The Commercial Cable Company (CCC), who were anxious to be associated with the project, therefore concluded that it was in the best interests of the United States, and the Public, to do the only thing which was left for them or any other Company to do, namely, come to an arrangement with the companies holding concessions from China. An arrangement was ultimately come to in 1901 with the CCC for the CPCC to be formed for the purpose of laying and working cables between San Francisco and the Philippine Islands, and the Company was incorporated on 17/9/1901. Draft Agreements were prepared and initialled in 1902, between the Eastern, Eastern Extension, Commercial Cable and Commercial Pacific Cable Companies. In the following year, 1903, the proposed Agreements were re-drafted on a broader basis, so as to include the GNTC, Eastern and South African and Indo-European Telegraph Companies and the Chinese Telegraph Administration. The Deutsch-Niederlandische Telegraphen-Gesellschaft (German-Dutch Company) had been formed in the meantime for the purpose of establishing cable communications with the German and Dutch Possessions in the Far East, and it was considered desirable to make an arrangement with this Company, so as to avoid competition, especially as the Company was subsidized by its two Concessionary Governments. This Company disappeared as a result of World War I, and its cables between Menado and Yap, and between Yap-Guam and Yap-Shanghai, were taken over by the Japanese or otherwise disposed of. It was subsequently agreed that the CPCC should extend its cables from the Philippine Islands to China and Japan. In addition the Japanese Government laid in 1906 the Bonin-Yokohama cable thereby providing a direct cable route from the United States to Japan. All the shares of the CCC were acquired by The Mackay Companies, so that now the American interest is represented by The Mackay Companies, and not by the CCC. Eastern Extension Coy. ) I. & I. C.
Each of the four companies is represented on the Board of the CPCC by its nominees. East. & S. African Coy. The balances due to of by the CPCC on Through and Local Pools are not paid to or received from that Company, but these balances are adjusted in the Pool accounts, the four shareholders of the CPCC having their share of the Pool receipts increased, or decreased, by one-fourth of the balance due to or by the CPCC. Apart from exceptional circumstances the Traffic Agreements in connection with the CPCC were due to expire on 25/7/1934 but arrangements were made in 1927 whereby the time of expiry was to be prolonged to 31/12/1940, subject to certain new Agreements and letters being approved by the United States Department of State and executed on or before 25/7/1934. We have recently been informed by the Mackay Companies that they are convinced that the United States Department of State will not approve an extension on their present basis of the Commercial Pacific Agreements as contemplated by the arrangements made in 1927. If this proves to be the case the question arises as to what course should be pursued in regard to future traffic arrangements in lieu of those proposed in 1927. The ship's specifications were: Length 358.4 ft., Depth 20.8 ft., Gross tonnage 3,180. She was hull #725. The cable equipment was manufactured by Johnson & Phillips, and the ship was registered in London. The four 3-furnace coal fired induced draft Scotch Marine boilers were pressure tested on Feb10, 1902 by Lloyds, and had a design operating pressure of 185psig. The ship was twin screw, with two triple expansion reciprocating engines with a combined 4600 HP and of 48" stroke and 85 rpm, with the LP cylinders being 68" diameter. Each engine had its own surface condenser, operated by an Edward's air pump off the HP crosshead. Engine speed was controlled by Aspinall governors, and the reversing gear was Stephenson link motion. Boiler feedwater pumps were the usual Weir design. Electric power was generated by two vertical compound engines driving DC generators. There were two fresh water evaporators of a basic design that were manufactured in 1901. There were also a few vertical and horizontal duplex pumps, fulfilling various functions. This writer has an unused Engine Room Log Card of the type used for C.S. Restorer in 1902-03-04. The CPCC was an amalgamated group, 50% owned by the British through the Eastern Telegraph Group, 25% American owned by the Commercial Cable Company, and 25% was Danish owned by the Great Northern Telegraph Company. The Restorer was an undocumented ship, flying the American flag after Sept., 1914, but having the crew signing on Canadian Articles. Restorer's duty was mainly to look after the Commercial Pacific Cable, laid in 1902-03. This ran San Francisco-Honolulu-Midway-Guam-Manila, P.I.. Adjacent cables were sometimes worked upon. The new cable needed little work in the early years. In about the first 10 years, Restorer's log showed 114 days at sea, and 3,750 days at anchor in harbor, in drydock, or at dockside. The first CPCC Master was Capt. Basil Combe, who formally took command of C.S. Restorer on Jan 1, 1905. Capt. Combe had 20 years of cable work behind him, with destiny giving him almost 20 more, all on C.S. Restorer. This ship had many long term crew members. Another one was Bill Pragnell who joined the ship in Singapore in 1904 as a cable splicer, and was with the ship for many years. The next long term crew member added was Jack Robb, Chief Steward, who joined the ship in late March, 1905, and who formerly was Purser on C.S. Scotia.